I have set up this blog to capture some of the problems we are bound to run into over the next 60 days. I work for a well known (read busy) commercial website in the UK. We currently use a traditional waterfall approach to our software development life cycle, and we are under pressure to deliver more, and deliver it more frequently. I am an ISEB certified Test Practitioner and I supported by two testers on my Team. Martin, a test analyst, who has achieved his ISEB/ISTQB Foundation certificate in software testing, and Robert, a junior test analyst who will be taking his foundation training later this year. We are all aligned to thinking about software testing in the same way. That is, we have a clear set of requirements (be they, technical, business or design) and we test against those; simple no? However in the real world it is never that cut and dried, and often requirements are thin, late or non existent, and (of course) liable to change at the drop of a hat. This is compounded further by the businesses increasing frustration at having to wait for a simple change to be implemented; we are only talking about a website here right? It’s not like we are trying to boil the ocean. Cue Music – Enter ThoughtWorks. Somewhere along the way the business got to hear of ThoughtWorks, a company that can offer (among other services) a helping hand for any software house wishing to become Agile. I don’t want to talk too much about ThoughtWorks and our relationship with them, because I only want to focus on the Testing aspect of becoming Agile, and because I could fill another blog with chatter about working with ThoughtWorks. Anyhoo, we are a Linux, Apache, J2EE & Oracle house. So it felt right that we should use Selenium for our automated testing. 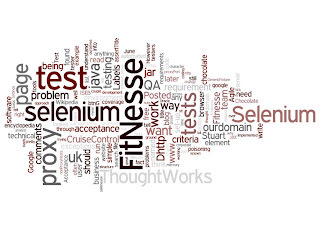 ThoughtWorks originally created selenium so it felt right to use it with them. We have looked at Selenium in the past and I have used selenium scripts with the most excellent Reality QA product from the guys at GOMEZ (more on that later). A couple of interesting points about selenium; Selenium is a chemical element with the atomic number 34 and is represented by the chemical symbol Se. Selenium can be found naturally in nuts (Brazil nuts are the richest ordinary dietary source), cereals, meat (such as kidney), fish (shellfish such as crab and lobster), and eggs. Selenium is often touted as “The cure for mercurial poisoning” (being poisoned by Mercury), and any tester can tell you that Mercury produced (before being bought by HP) some highly priced automated test tools of the variety that “require plug-ins” to do anything more ordinary than record and playback (Test Director for instance). So I think the developers of selenium thought it would be funny to name their product Selenium. I think however that the last laugh may be on them, because selenium is not actually an antidote to mercury poisoning, it’s just a chelating agent for heavy metals including mercury and although selenium is an essential trace element, it is toxic if taken in excess. There is no known antidote to selenium poisoning. Why do software test teams get a bad name?